Tomatoes are botanically fruits and are rich in lycopene, a powerful antioxidant. Lycopene’s bioavailability is more in cooked or processed tomato products, with the main factor being heat. Almost all of our recipes use tomatoes and I wanted to post one which is exclusively dedicated to tomatoes. 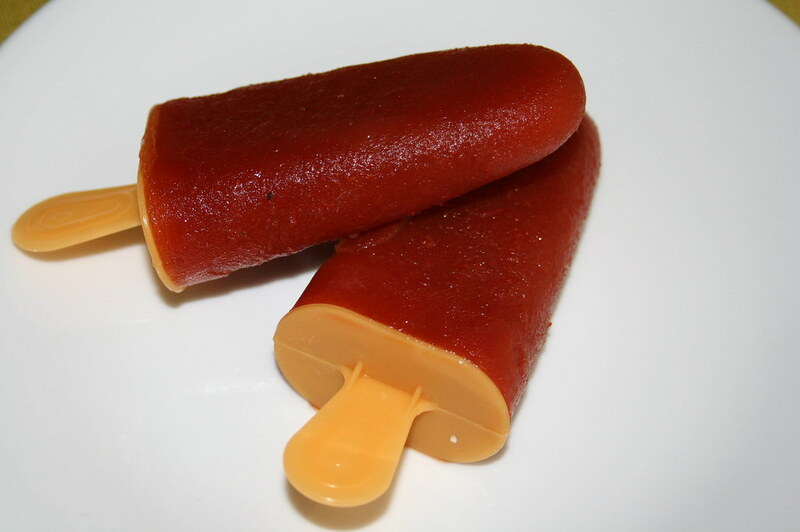 Though popsicles are available all over the world in flavors unique to each region and culture, the pops which we find back home are predominantly in mango, orange, grape, pineapple, milk and vermicelli. I remember all my summer holidays spent back in my maternal grandparents house and pops play a vital part during those sweltering heat waves. I tried the pops available here and my tastebuds did not take to them very kindly! 🙂 I like tomatoes a lot, so why not make it into a popsicle? After all it is a fruit! Here’s the recipe…I can tell you that you won’t be disappointed…And your kids will love them! Add 1/2 cup of water to the tomato paste and whisk it together. Boil sugar, water and cloves together and make a simple sugar syrup. Please note that by sugar syrup, I don’t mean a single thread consistency. The syrup is the stage before that, when the mixture has slightly thickened. After the sugar and water mixture has come to boil, keep boiling for a couple of minutes to reach the syrup stage. To the tomato mixture, add as much syrup as you want according to the sweetness desired. Add the lemonade next along with lemon zest and black salt. Stir everything together and pour into popsicle molds and freeze for a couple of hours. Tomato Pops are ready to be taken to the JFI-Tomato party hosted at RP’s My Workshop!